Pub on Whitecross Street. It's the best option for local drinking to the Barbican Centre, given that venue's lack of decent drinking options. There are three handpulls, and it serves decent enough London Pride (under £3). 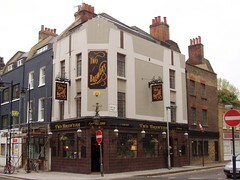 On Ewan's visit in November 2008, two were off and only Greene King IPA was available. Plenty of bottled beers are on offer, and a bottle of Leffe was £3.10. No food, but you are allowed to bring your own (a sign advertises as much), which is convenient given its proximity to Whitecross Street Market, although that is not open in the evenings. When secretlondon visited in July 2015 there were four handpulls and two meantime beers on a lager pump (not sure of technical term) and some others I didn't notice. A pint of landlord was £4.30. Not sure of the full opening hours, but it was certainly open when bob visited at 11:30am on a Monday. Last visited by Ewan and Jo, 9 November 2008. Last edited 2016-06-20 14:14:29 (version 12; diff). List all versions. Page last edited 2016-06-20 14:14:29 (version 12).